Just got back from Cincinnati yesterday, a very interesting city. Looks like a nice place until you start driving through the city streets and seedy neighborhoods. I spent most of my visit on the University of Cincinnati campus, which is also a pretty unique place. Lots of abstract architecture, sculptures, installations, etc. spread across the school. I got to visit Shake It Records, which from the looks of it is the premiere record store in the Cincinnati area. A great selection of CDs, and a respectable amount of new and used vinyl. However, my main reason for the trip was the MusicNOW festival, now in it's third year, which took place at the beautiful Memorial Hall in downtown Cinci. The festival was a four night series of concerts, curated by Bryce Dessner (the guitarist for the National, and a Cincinnati native). I only made it to the Friday and Saturday night shows, so I'll be focusing my attention on those, although I heard that Wednesday and Thursday weren't too shabby, with guest appearances from Sufjan Stevens and the Arcade Fire's Richard Reed Parry. 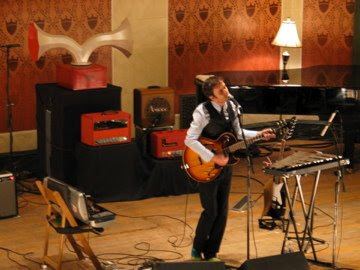 Friday night's show was split between the jazz guitar styling of the Dirty Projectors and the Bang on a Can All Stars, a modern music ensemble which featured Bryce Dessner sitting in on guitar and Glenn Kotche on drums. Having not really listened to much of the Dirty Projectors before, I was pretty impressed, especially with the lead guitarist. The guy is very talented, and the band overall was in pretty fine form, despite the fact that both the bassist and rhythm guitarist were suffering from a case of the flu. Their set was quick, and soon enough the Bang on a Can All Stars took the stage. The ensemble started off the their set with some pretty standard modern pieces, enjoyable enough, but definitely not what I was there to see. Glenn took the stage after a short introduction, care of Dessner, and began to talk the crowd through what they were about to hear. The first piece was one commissioned by Bang on a Can, entitled "Snap"; a tribute to the Stax Records label of the 1960s. Kotche's composition genius really shown through in this piece, his experience with composing for the Kronos Quartet has obviously emboldened him. Kotche's next piece with the group was an ensemble arrangement of the Mobile suite, from his Nonesuch solo release of the same name. Having seen Kotche play this piece solo with the help of a prerecorded backing track, I couldn't help but imagine what it would be like to see this composition entirely live. This performance was the fulfillment of that dream, and was just as great as I imagined it would be. Some liberties were taken with the material due to the makeup of the quartet, but it was still an extremely impressive song to see an ensemble play. 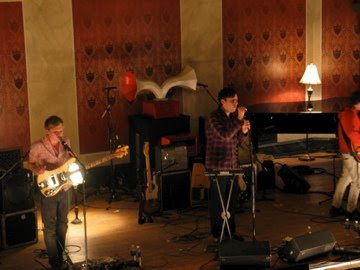 Saturday's bill featured the group Grizzly Bear as well as a solo performance by Andrew Bird. Grizzly Bear's set was great, albeit a little too short in my opinion. The group is definitely one of my favorite new groups of the past few years, particularly their recent release Yellow House which has been in frequent rotation on my playlist as of late. They got through most of the songs that I wanted to hear, with the glaring exception of "Easier" which seems like an obvious opener to me. I also had no idea the band's bassist did so much work, he barely seemed to touch his bass, usually providing clarinet or flute instead. A really impressive performance, and one that I wish would have gone on a little longer, especially in light of the next performer. Don't get me wrong, I'm an Andrew Bird fan. However, I've had the unique pleasure of seeing him play with his band and his solo performance at this festival got a little stale to say the least. It was also not helped by the fact that he played very few familiar songs, opting instead to debut songs off of the record he is currently recording. The older tunes he did play lacked the polish that he usually provides; many forgotten words and chords were scattered liberally through the set. While I understand the circumstances under which this performance were taking place; a one-off show likely as a favor to Dessner, I don't think that excuses Bird entirely especially since the guy is so damn talented to begin with. At least we got spirited renditions of "Why? ", "Plasticities" and "Weather Systems", and most of the new songs sounded pretty solid although I'm sure I'll like them more once their fleshed out with some Rhodes and drums care of Dosh. Not the best way to cap off the fest, but I was still more than satisfied and hope to come back next year.